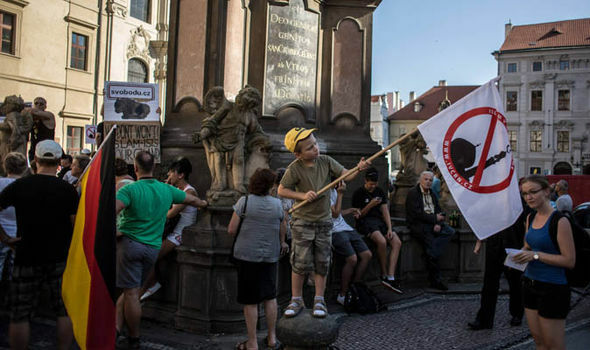 ANGELA Merkel was greeted by furious crowds calling on her to quit when she arrived in the Czech Republic today for a meeting about the migrant crisis. Fuming protestors waved placards depicting the German Chancellor as Adolf Hitler and chanted the famous slogan “Merkel Muss Weg” – meaning “Merkel Must Go” – in a show of defiance against her migration policies.The crowds of angry demonstrators all blew loudly on whistles as they denounced Mrs Merkel, who was visiting the central European country for a meeting with its prime minister Bohuslav Sobotka. 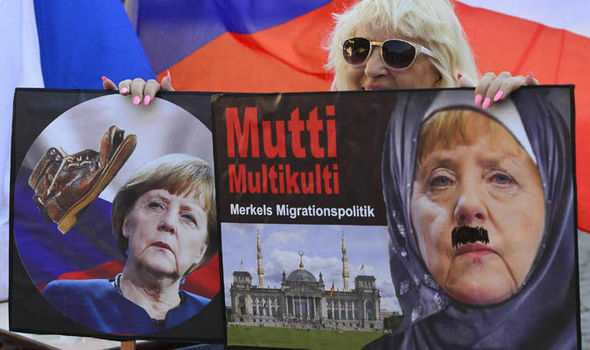 One protestor waved a placard showing the German leader with a Hitler moustache, whilst another had made a poster featuring the EU flag next to that of Nazi Germany.They were separated by police from a small counter-demonstration, where out-of-touch leftists displayed welcome signs for the German chancellor featuring her famous proclamation “Wir Schaffen Das” – “We Can Do This”. Anger has been growing for months in many central European states, including the Czech Republic, that have been on the frontline of the spiralling migrant crisis.Many voters blame Mrs Merkel directly for the refugee chaos, saying her open invitation for millions of asylum seekers to settle in Germany has brought crisis to their countries. As a result there has been a growing political revolt against German-led EU migration policies in the region with Austria and Hungary leading calls for a controversial migrant relocation scheme to be scrapped.